My longtime friend Sarah served me a most delicious lunch when I stopped to visit her in Northampton, Massachusetts on my way to Vermont. The star of the meal: her mother's "gazborschto," a cold soup featuring the best of both borscht and gazpacho. We topped the soup with chopped cucumbers and scallions. 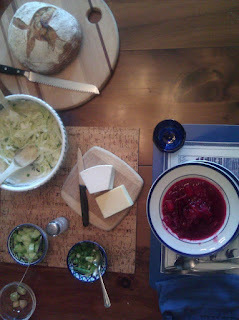 Sarah made a simple cabbage salad and also put out a loaf of rosemary bread and a few hunks of cheese. It was a perfect meal to share with an old friend on a hot summer day. It was a pleasure to cook for you and wonderful to have an afternoon together! Sounds wonderful. Cheese, soup, rosemary bread? It looks beautiful...and aren't the best meals those shared with old friends? Thank you for sharing with me. And thank you for your kind words and continued support. They mean more to me than I can express! Have a wonderful weekend!